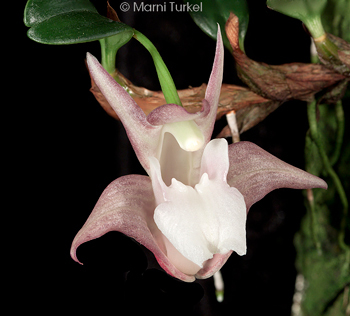 Dendrobium fargesii (syn. Epigeneium sansiense) outcross #1484 ('0333' x '0382') (approximately 25 seedlings per flask). 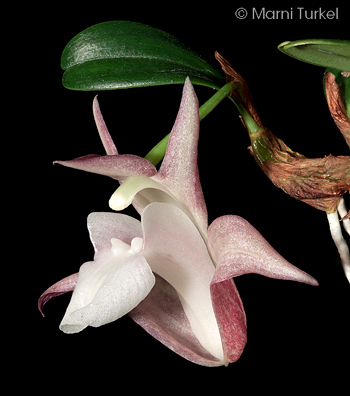 The Species: This has been known in collections as Epigeneium sansiense as well as its current name of Dendrobium fargesii. 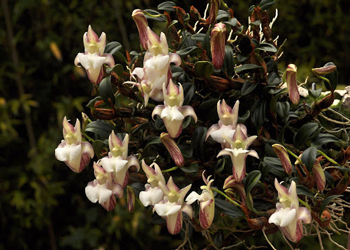 It is found from Bhutan and Thailand, through the Chinese Himalayas and into Taiwan at elevation from 4000 to 5800 ft as an epiphyte and as a litohphyte. 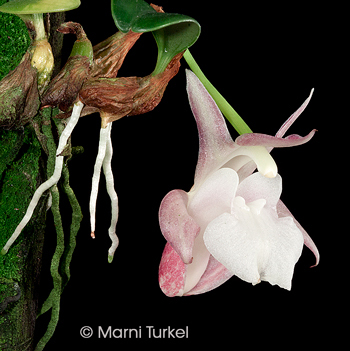 The flowers can be between 1 and 1.25” tall and are as big or bigger than the plant itself. Culture: I have always grown this mounted, usually on cork, and watered it almost daily. I give it moderate light and year round watering. It has done best for me in cool conditions.